The Calgary Flames are trying to make a run at the Northwest Division title. The Vancouver Canucks are just hoping to reach the playoffs. The division rivals could have a hand in determining each others postseason fate when they get together for the first of two meetings in seven days Sunday in Vancouver. Calgary (40-28-10) missed a chance to move closer to division leader Minnesota after falling 2-1 at home to Edmonton on Saturday night. That loss left the Flames three points back of the Wild and tied with fellow Northwest rival Colorado for the sixth playoff spot in the Western Conference with four games remaining. All those contests will be on the road against division foes, including a regular-season finale with Vancouver on Saturday. "Every game's like a playoff game," Calgary's Daymond Langkow said. "We just have to forget about it and focus on (Sunday) night's game." The Canucks (38-30-10), meanwhile, are tied with Nashville and the Oilers for the eighth and final playoff spot in the West. The Predators, though, hold the tiebreaker over the Canucks, who lost 4-0 at Minnesota on Friday for their fourth consecutive defeat and sixth in nine games. "There's a lot of character (on this team)," Vancouver's Ryan Kesler said. "Right now we're going through a little adversity, but that's when we're at our best." The Canucks don't have much time to back up that statement with just four games remaining themselves. Though all will be played in Vancouver, the Canucks face Colorado and Edmonton without alternate captain Brendan Morrison, who suffered a season-ending knee injury in a 6-3 loss to the Avalanche on Wednesday. Vancouver is 4-2-0 versus Calgary this season, but the Flames have won the last two meetings, including a 3-2 home win over the Canucks on Tuesday. Friday's loss marked the second time in eight games the Canucks were shut out, while opponents have outscored them 15-6 in their last four contests. Roberto Luongo was pulled for the second straight game after allowing four goals on the first 17 shots he faced against the Wild. Though he was recently back in Florida with his wife for the birth of their first child, Luongo has given up nine goals in his last two starts. Despite his recent struggles, Luongo is 4-2-0 with a 2.32 goals-against average against the Flames this season and might not totally be to blame for the Canucks' poor play. "The guys in front of him have to play better in every area," Vancouver's Markus Naslund said. "He's been there for us all year, and if it wasn't for him we wouldn't be where we are. It's up to us to play hard for him." Naslund, who had an assist at Colorado on Wednesday, has three goals and four assists versus Calgary in 2007-08. On Saturday, Matthew Lombardi broke a scoreless tie early in the third period, but the Flames allowed two unanswered goals for their second loss in three games. Miikka Kiprusoff made 19 saves against Edmonton and is expected to be in goal Sunday looking for a third straight win over Vancouver. 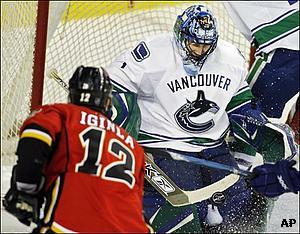 Kiprusoff has stopped 56 of the 59 shots he's faced in his last two starts versus the Canucks.